After long winter months with heavier foods, April brings welcomed relief as farm-fresh vegetables reappear in food markets – tender, sweet and super crisp. Look for green peas, new carrots, artichokes, spring onions and – my favorite – asparagus. I usually prepare asparagus as simply as possible. I give the fresh spears a quick soak in water infused with a drizzle of olive oil. Then I grill, sauté or even bake them until crisp-tender. Drizzled with a little more olive oil and sprinkled with flakes of fleur de sel salt, it’s officially springtime in my kitchen. 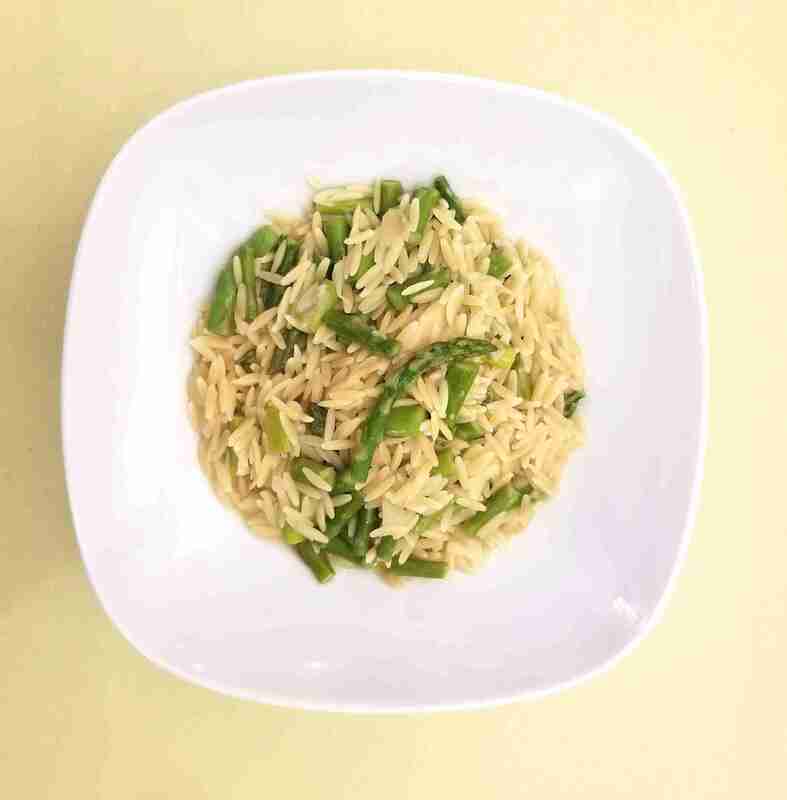 I also like to make this asparagus orzo pilaf. It’s a good spring entrée because it’s still comfort food for a cool day, with the bright snap of fresh asparagus. 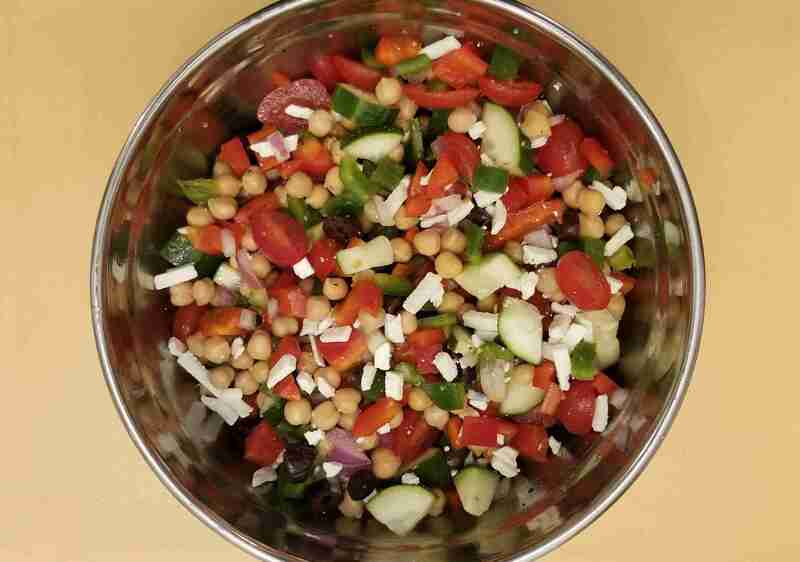 To tide me over until summer’s bounty of fresh produce arrives, I pair the entrée with a Greek salad made hearty with the addition of chickpeas. It has vegetables that are easy to find in markets all year and is dressed with citrus vinaigrette to keep it light for days that are getting longer and warmer. Trim tough bottoms off asparagus and discard. Cut spears into 1/2 inch lengths. In large skillet over medium heat, heat oil and sauté asparagus and onion until crisp-tender. Remove to a bowl and set aside. In same skillet over medium heat, melt butter and stir in uncooked orzo pasta. Cook and stir frequently until orzo is lightly browned, about 3 minutes. Stir in broth, salt and pepper; heat to boiling. Reduce heat, cover and simmer about 10 minutes or until orzo is tender and liquid is absorbed, stirring occasionally. Stir in asparagus/onion mixture, then add cheese to taste. Place all salad ingredients in a large bowl and toss gently to combine. In a small bowl, whisk together olive oil, lemon juice, garlic, salt and oregano. Add pepper if desired. Pour onto salad, and gently toss again to combine.